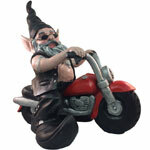 In addition to our classic, light-up and even famous gnomes, we carry sports gnomes for the sports fan in your household. 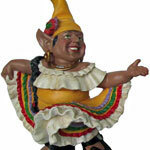 Your husband will join you in the garden if you add one of these fun and sporty figures to your flowerbed. 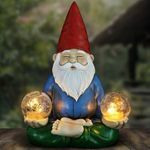 Everyone loves the traditional red-hatted garden gnome, but these take your outdoor decor to a new level. Pay homage to your garden and your favorite sport at the same time with one of these GardenFun.com originals! 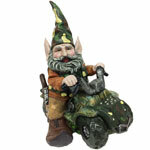 We carry male and female gnomes that every hunter will love. 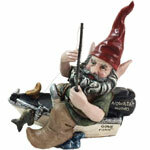 Our male hunter gnome comes with a camouflage vest and hat set, along with a gnome-sized rifle and over-sized boots. The female 15-inch hunting garden gnome is just as tough, wearing her camouflage outfit and holding her beloved rifle at the ready. This hunting pair might even help keep pesky squirrels away from your azaleas. For the green thumb in your life, give them a garden gnome that comes with their own gardening equipment. This adorable and cheerful figure is carrying his watering can and gardening supplies to help with your weeding and pruning. He’ll cheer you on as you work on your own flowerbed. This little guy is available in 15 and 21 inch sizes to fit your garden. Athletes will love our baseball, speed racer, golf and soccer gnomes. 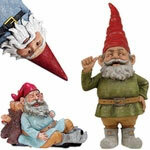 These hand-painted statues are the perfect garden gifts for gnome lovers and sports lovers alike. Grab a golfing lawn gnome as your next retirement gift. We carry a mid-swing gnome golfer and a gnome in putting position. 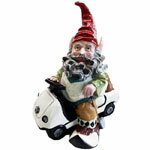 Our speed racer gnome is one of our most popular models. This bold statue comes complete with a racing uniform, helmet and goggles. 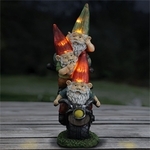 Our gnomes will become a fixture in your garden for years to come. 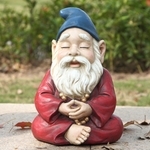 Choose from the gnome size and style that complements your family or find the gifts your friends will love at GardenFun!